The conclusion of a second Trump-Kim summit with no North Korean opening to the West puts an even greater premium on the research that Maya Stiller, University of Kansas assistant professor of the history of art, has been able to do inside the hermit kingdom, and about which she continues to publish. In a forthcoming article in the 2019 edition of Cahiers d'Extrême-Asie (Journal of the Far East), a bilingual journal published by Ecole francaise d'Extreme-Orient (the French School of the Far East) in Paris, Stiller writes about medieval Buddhist practices revealed in a sacred mountain range just north of today's Demilitarized Zone. She outlines the burial of a number of small sculptures of buddhas and bodhisattvas (i.e., deities and near-deities), along with their likely origin and purpose. The range is called Kŭmgangsan, or the Diamond Mountains, and Stiller visited there in 2008 and again in 2014, taking thousands of photos of ancient rock carvings and Buddhist monasteries. Kŭmgangsan was open to a limited number of South Korean tourists between 1998 and 2008 under an arrangement between the North Korean government and the South Korean industrial conglomerate Hyundai, Stiller said. She visited under that program just a few days before it was shut down after North Korean soldiers shot to death a South Korean tourist under mysterious circumstances. Stiller returned in 2014 by booking an individual tour with United Kingdom-based travel agency Koryo Tours, which specializes in travel to North Korea, to do further research in an area that was not open to tourism, even during the 1998-2008 period. She says Kŭmgangsan is a popular topic in Korean art history, the subject of many paintings, travelers' stories and even songs. She became interested in the general topic, and then in the mountain's role as a Buddhist pilgrimage site in pre-modern Korea. She's working on a book about her discoveries. "There was no North Korea prior to 1948," Stiller said. "Korea was just one peninsula with one culture, and so you have got to look at this from a holistic perspective." In her most recent article, Stiller focuses on a series of small sculptures of religious figures – smaller than Barbie dolls – placed into ceramic jars and buried in niches in the Kŭmgangsan mountain range during the 14th and 15th centuries. Most of the ones known today were uncovered during 20th-century construction work in the area. She writes that the practice "served a religious purpose for the temple or community that buried them." Physical and written evidence, Stiller wrote, "show that the sculpture burial patrons wished for a better rebirth … the main purpose of this burial was to avoid falling into any of the three evil destinies—the worlds of hells, hungry ghosts and animals—and to be reborn in Amitabha's Pure Land." In order to secure these benefits, Stiller wrote, "locally prominent individuals visited sacred mountains near their villages to bury sculptures as an offering to divinities that were believed to reside at the mountain. (At) Kŭmgangsan … the divinity in residence was the bodhisattva Dharmodgata." 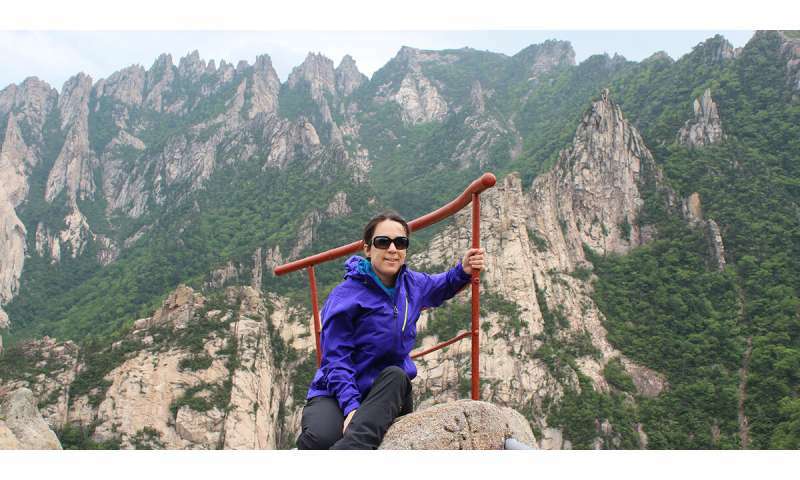 "My research provides an alternative perspective to the prevailing notion that sculptures were buried at Kŭmgangsan solely because of the mountain's connection with the Flower Ornament Sutra," Stiller wrote. Rather, relying on geographic information system mapping data about the burial locations, "pilgrims intentionally buried their sculptures near or in the line of sight of peaks and cliffs associated with Dharmodgata and his disciple Sadāprarudīta." Stiller said her article not only contributes to a deeper understanding of local religious practice in pre-modern Korea, "but it also emphasizes the importance of studying the placement and spatial context of Buddhist statues, paintings and other objects, in order to better understand their ritual function."